I've not read any of his books, mostly because I'm not a fan of the genre. Still, my husband once heard him give a speech at his university, and he said that he was nothing like he imagined. He was very impressed. I may pick up one of his books this summer. I completely agree with all of your points; Nicholas Sparks is a great author. I just finished "The Lucky One" this week and it was beautiful. 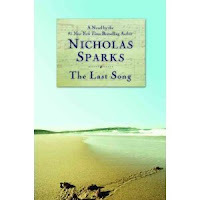 "The Last Song" is my favorite of his books! I love the way that he writes the relationship between Ronnie and her father. He's such a great story-teller! I listened to his non fiction biography audiobook called Three Weeks With My Brother and LOVED it! I have read a couple of his fictional stories, but the biography was definitely my favorite. Very well written. Your blog post makes me want to read his latest, though! OMG, I have heard enough of 'The Hunger Games' to last me into 2020! In fact, as a result of the movie, I wasn't going to read any of the books. As for Sparks, yes, he knows how to tell a story. As you said, some people like and dislike him, it all boils down to a matter of choice. I like him. I have a love/hate relationship with Nicholas Sparks. He is the one author that is capable of reducing me to a watering spout. It started with Message in a Bottle - I must've howled like a banshee at the end. of course, thinking that it was a fluke, I read A Walk to Remember - same outcome, all out of tissues. I haven't read any of his books since for fear of dehydration. I've read Nicholas Sparkes and I either love or hate his books. He's not a writer I's pick up knowing I'll enjoy his story.